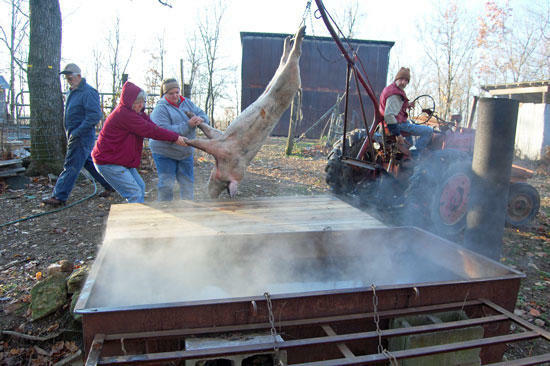 Tammy Hughes and Tina Fletcher, Bobby's daughter, pull the hog onto a platform as steam rises from the scalding box. Bobby Nichols is in control on his 1950 H model Farmall tractor. On a cold, breezy November morn up on a ridge somewhere between Woodbury and Auburntown, Bobby Nichols yearns to get going. Around 3 a.m., about three hours before daybreak, he's got a good fire roaring in the backyard beneath his homemade scalding box. In about four hours time, the first of several hogs will be soaking in the heated water. Nichols is prepared for hog killing time. He's been ready for days, maybe even weeks, but now that Thanksgiving's coming on and the weather's dipping down close to freezing temperature, well, he's done this enough to know today is the day. Hog killing is a Nichols family tradition that goes back generations. Bobby's grandfather, who was born before the Civil War, bought property out here off of Pleasant Ridge Road more than 100 years ago. "Back when Daddy killed hogs, I was too little to help," says Nichols, 59. "I have no idea when I began: When I was a teenager, I guess. But I remember them killing hogs over in the holler when I was less than 5 years old." Bobby and Mariea, his wife of 37 years, live in a log house with a tin roof. They built their place with old and new logs in 1993. They heat with a wood-burning heater, and their long, front porch is stacked with heaping piles of fire wood. Cats, dogs, a rooster, chickens, horses, cattle, a burro and, naturally, hogs, populate the farm where they raised daughter Tina and son Charlie Joe. With the fire beneath the scalding box in fine shape, another tradition tempts those seated around the table in the kitchen: Mariea's sunrise breakfast of ham, sausage, eggs, biscuits, gravy and coffee. The ideal weather for killing hogs, says Bobby, is a dry day with the temperature ranging from freezing into the 40s. This day hits the mark. "Breakfast is a staple around here. You may not get anything else, but you'll get breakfast," says Mariea, who grew up in Woodbury. She will miss the grisly work on the farm today as she drives a bus for Upper Cumberland, chauffeuring senior citizens to doctors' offices and other appointments in Cannon and nearby counties. She will dive elbow deep into the action on the second day. Her chores? "Whatever needs doing at the moment. Mostly I keep 'em fed. Tomorrow's my day, packing up the meat, getting it in the freezer, grinding sausage. It usually takes three days to get everything done. The last day you generally cook up lard," Mariea said. The Nichols family always kill hogs on Thanksgiving. It often draws a curious crowd. "Sometimes they'll be so many people just standing around, sometimes people in the way. Some boys wanting to kill hogs but don't know how will come to watch and try to remember how. There's nuthin' out of ordinary in it. Just the way it's always been," said Nichols. "We don't kill for nobody else. There's no money involved. We don't want no government involved. This is worse than bootlegging," says the semi-retired locksmith, who still works two days a week at MTSU and also pastors at Shiloh Baptist Church this side of Auburntown. At 7 a.m., Nichols heads to the hog pen that holds nine 1-year-old hogs that weigh about 350 pounds apiece. He raised these Yorkshire, Duroc and Chester White cross oinkers on 12% protein commercial feed. He looks over the pack, selects one and a bullet from his .22 rifle goes straight to the head, knocking it out. Nichols then takes a knife and quickly sticks it in the throat to bleed it out. He works calmly and methodically, chewing tobacco as he goes about his bloody business. The hog is then dragged from the pen, hooked and hoisted from the ground by the power of Nichols' 1950 H model Farmall with a Ford front end. He drives it across the muck to the other side of the barn yard and with a water hose rinses the hog from bottom to top. "When I met Bobby, I didn't have a beard, didn't own a truck, didn't have a farm, didn't play music. Now I have a beard, a truck, a farm, and he got me playing a guitar, and we just have a big time," confessess Caudill, an engineer and MTSU's director of building services, who lives in Murfreesboro but has a farm in Cannon County. He and Hughes assist Nichols in getting the hog on a wood platform and then shove it off into the 7-feet-long by 3?-feet-wide scalding box. The water, about 2? feet deep, brews between 140 and 150 degrees, and steam rises off the top, only to be whipped about by the strong wind. The workers can also see their own breath. Nichols' daughter, Tina, has now joined the labor force. She teaches agriculture to about 145 students in the ninth through twelfth grades at DeKalb High School in Smithville and lives close by in the house that her grandparents, Bobby's father and mother, lived in before they built the cabin. "I've been killing hogs since I was born. We've always done it. I've always been a part of it," says Tina. "It's kind of funny. People got away from doing it, but they are starting to do it again, maybe because of the economy." The hog's body is immersed in the scalding water for two to three minutes. This makes the task of scraping the hairs off the swine easier. The workers use their hands to pull out the some of the hair, then really get down to it with knives as they scrape the hairs from the carcass, from the ears and head to all four feet. "It's a pretty good scald," says Nichols as Tina dips a thermometer in the hot water and reads aloud "150 degrees." "This is the first time I've ever given a pig a pedicure," says Caudill, while plucking hairs from a foot. "It doesn't take long before this becomes work. "When I was young, they wouldn't let me out of the house for hog killing," says the transplanted Virginian. "But they'd bring me the tail and that was my toy for the day." Nichols reminisces of how he got an excused absence from being late to school one day after helping his father kill a hog. He bribed the teacher with a couple of tenderloin and biscuits. "That's the cleanest head I ever seen, Bobby Nichols," says Hughes, who has helped Nichols kill hogs for the past six years, referring to his efficient scraping method. Hughes, the key shop coordinator at MTSU, lives in Woodbury and admits there is one thing that keeps her coming back. "I like ham," she says with a laugh. "I'm like part of the family and just happy to help." Caudill backs a few feet away from the bleached-looking porker in front of him when Nichols comes over to his side of the hog. "I got sense enough to know to get out of the way when the master's at work," he says of Nichols' handiwork with the sharp knife with which he is scraping fast and furious. When the hairs are gone to the patriarch's satisfaction, he asks, "Tina, can you gut? Better not cut a gut." With a knife, a meat saw and an ax, father and daughter continue their task of making fresh meat. Nichols slits the hog from bottom (the carcass hangs from its hind feet so that the head almost touches the ground) to top. Once the upside-down pig has been split and disemboweled comes the blocking. Nichols uses knives to slice the body into specific portions. First, he cuts off the head. Attacking the body, he cuts out tenderloins, then the backbone or back strip, which furnish pork chops and pork loins. Next he trims around the ribs for more loins and pulls out the leaf lard. Then he turns his attention to the ribs, then the sides, shoulders and the ham. On the second day, Bobby and Mariea will trim and put up these portions into smaller pieces to go in the freezer. The third day they will cook out the fat to make lard and sack out the sausage. "Basically, it's all got to be done," he says earnestly. The most important thing to know on Day 1? "The most important thing is picking the right help," says Nichols. Tina offers a different opinion: "Picking the right stock is important. You can do this all day long, but if it's sorry to begin with, it's gonna be sorry at the end," she says about the meat. Why do the Nichols work so hard over three-day periods to continue their family tradition? "Ham," he succinctly sums up the reason. "Hey, you can't buy a ham like we can do it." "And you can't buy sausage or bacon either," Caudill chimes in. Bobby and Mariea, best they can recollect, have never purchased store-bought ham. "If we ever bought one, it ain't ever made any kind of an impression," said Nichols. As for a mighty fine lunch at 11 a.m. this first day, well, the freshest possible tenderloins placed between biscuits make do rather nicely. Twenty-four hours later, Nichols can be found with a knife in his hand, trimming out the hog meat while standing inside the smokehouse his father built from oak lumber back in the 1960s. Part of the foundation once supported the old Jones Chapel Church and schoolhouse. "There's the heads," he says, pointing to a bucket on the ground that holds three hog heads. "A lady's gonna come by and make souse." What he enjoys most about the marathon process of killing hogs and getting their meat into the freezer? "You have to learn to like it all. There's so much work in it, you need to like it. But I look forward to the night when I get all this done, get to eat fresh sausage, get that sausage ground and get to eat that. That's what I look forward to." Over the next few weeks, the Nichols family will probably kill seven to nine hogs. He philosophizes a bit on the quality of the meat. "I'll tell you about hams. When we get to these hams here, when we get 'em done. One will be better than the rest of 'em. And I don't know why. All hams are not created equal." He begins the salting down of the hams this afternoon, using meat-curing salt. Around Christmas he will take the hams out of the salt, hang them in another smokehouse and using hickory and maybe a little maple will smoke them for a week. He'll take them down, apply red peppers and borax and then hang them back up. "It ain't over today," he says of the work. "This goes on till January. I'll smoke it all. We let it hang for a year, maybe two, before we eat it." This morning, Mariea has been packing up backbones and ribs, getting it ready for the freezer. By late afternoon, she will be making sausage, the likes of which could put Hardee's out of business. "We used to hand grind sausage, but I got old," she jokes, referring to the electric grinder that she uses now. What she like most about the grueling work? "Getting done. It being over with. I enjoy it. I like being done, having the mess cleaned up and over with. But what I like best? I like the tenderloins the best and the hog jowls at New Year's," Mariea says. In the smokehouse, Nichols places a ham on a wooden shelf about waist high. He has already prepared a small bed of salt to plant the ham in. He packs the salt around the side of the ham and on top. A few minutes later, after the meat has absorbed most of the salt, he rubs light brown sugar into the ham. "That sugar soaks down in that ham," says Nichols. "Salt is what I cure it with, but that sugar makes the difference. Three or four good handfuls of brown sugar, enough to make it good. Then you come back to the salt. "A lotta people put the ham in a box, but I like this better (letting it sit on a wooden shelf). I come back tomorrow and put a little more salt on it." Nichols will continue to apply the salt as long as the meat keeps soaking it up. This could be from a few days to a couple of weeks. Then it sits undisturbed for about six weeks, usually until New Year's, when he will smoke it. "Daddy taught me how (to do all of this). How to put on the sugar; how to smoke. They were perfectionists in how they made their meat. Everything had to follow an order just so and so, but we live so fast. Sometimes I think he would be ashamed of me. 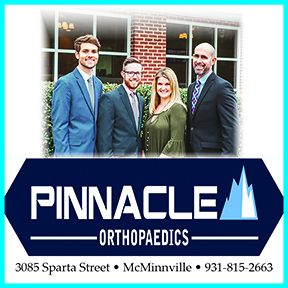 They were patient, and it had to look like a picture when they got done." Of course, the true test comes by taste. And the Nichols wouldn't have their pork any other way except by the old way, handed down from generation to generation, which means salt, sugar, smoke and tender loving care. Bobby shares a funny story about back when Mariea worked at the hospital as a phlebotomist. "She urged me to get my cholesterol tested. Well, that morning I fried three skillets of hog meat and then had my blood drawed . I told 'em what I ate, and my cholesterol total was 125 (a healthy, low number)," he laughed. "They made me not eat nuthin' and come back, and my cholesterol was 125. So it was the same." But, going back to why he goes through this laborious process every fall, he answers, "It's just a way of life: What we've always done. Why do we keep doing it? Somebody's got to know how. It's sort of just who we are. So when I kick the bucket, you better have a little ham back here." "Yes, sir," says Tina, offering the perfect answer that her father, a premier Tennessee County hog killer, wants to hear. "We can make a country ham pretty good," says Bobby Nichols, as he allows a modest smile to cross his face. I think I may throw up. Way to stay classy, Courier. Fred, you are correct - no one forced me to read it. However, I was not given the choice of avoiding the photo. Had the photo not been placed so prominently on the main page, I could have avoided the story completely. Alas, I was not given the choice of avoiding a photo that I consider to be graphic and disturbing. Perhaps the Courier could have used some discretion in placing the photo on the main page? Instead, the photos could have been placed in such a way as to only make them visible to those who choose to read the story. Thanks for the very descriptive story of killing hogs in Cannon County. I was born on a farm over off Rush Creek Road in Sanders Fork community. The house was an old log cabin that had been modernized with siding, but still had the tin roof. I was raised on the farm until we moved to Woodbury when I was 10 years old. I too was little and couldn't help my dad and the neighbors kill hogs, but I remember most of the steps described in this story. We didn't have electricity on the farm until 1948, so salt curing was my parents' only way of preserving the hams, shoulders and side meat. I did get to help in grinding the sausage, with the manual grinder fastened to a board over a wash tub. Daddy would add the sage and spices while my mother sewed the cloth bags in which she stuffed the sausage. They didn't smoke the meat, but as I remember it sure was good when my mother fried the sausage and ham on her wood burning stove for breakfast. And of course she made the best biscuits I have ever tasted. Fond memories. I'm just glad that someone in Cannon County still does this the olf fashioned way. I remain somewhat loyal to the old ways; I purchase Tennessee Pride country sauage at the local Publix grocery store (lol). Thanks for the story. i will assume ,tank, you are a vegetarian or did you have a nice big sausage biscuit for breakfast?